Shoulder pain can make performing everyday activities difficult. Since your shoulder is used in most any of your arm movements, pain in the shoulder joint can have serious affects on your daily life. The most common cause of shoulder pain is shoulder arthritis. When arthritis strikes, the protective cartilage in the shoulder joint is affected. The cartilage in the shoulder joint allows for smooth movement, and when it is either inflamed or worn away, the result is pain and stiffness. Shoulder arthritis can develop as you age, but a shoulder injury can also lead to shoulder arthritis at any age. Also called wear-and-tear arthritis, osteoarthritis (OA) is a condition that progressively wears away the cartilage of the shoulder bone. As the cartilage wears away, it frays and roughens, and the protective spaces between the ball-and-socket bones narrow. When you move, joint bones rub against each other, causing pain. OA typically affects people over 50 years of age. Rheumatoid arthritis (RA) is an autoimmune disease that attacks many different joints in the body. Usually it affects both sides of the body, so if you have RA in one shoulder, you probably have it in the other. RA causes the protective linings inside the joints to swell, causing stiffness and pain. Posttraumatic arthritis is a type of OA that occurs after a shoulder trauma, such as dislocation of the shoulder or a shoulder bone fracture. This condition develops and causes pain when there’s a tear in the rotator cuff. The top of the upper arm moves out of place and then rubs against the top of the shoulder blade, wearing away their protective surfaces, which leads to arthritis. Avascular necrosis (AVN) happens when the blood supply is cut-off to the head of the top arm bone. The bone cells die due to lack of blood supply. Over time, AVN can destroy the shoulder joint and cause arthritis. What Are Symptoms of Shoulder Arthritis? What Are the Treatments for Shoulder Arthritis? 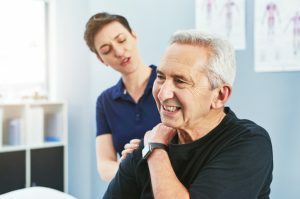 Each person’s situation is unique, so your doctor will make shoulder arthritis treatment recommendations based on your circumstances. Rest the shoulder and avoid activities that cause shoulder pain. To improve shoulder mobility and strength. Injections into the shoulder joint to relieve pain. Applying ice to your shoulder two or three times per day to relieve pain and reduce swelling. If nonsurgical treatment options aren’t effective, your doctor may recommend surgery. Arthroscopy or open shoulder surgery can help relieve the pain and swelling caused by shoulder arthritis. An additional option is platelet-rich plasma therapy that helps promote healing, relieves pain, and speeds up recovery time. To find out more or to get started, contact us today.